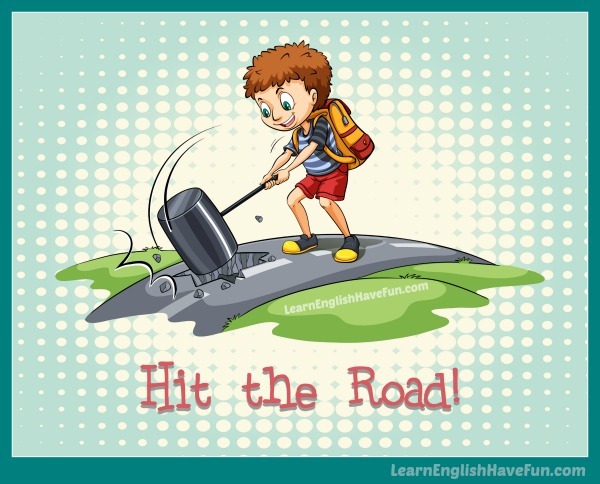 Look at the picture and try to guess the meaning of hit the road idiom. Hmmm, it's not so easy to understand is it? But the photo can help you to remember it. Hit the road: to leave (especially to go home); to depart on a journey (especially to travel to a place by car). The guy in the photo is hitting (banging) a sledge hammer into the road. He's making a big hole in the road. That's a literal meaning of the idiom. But that's not what we're doing here. Instead, we're talking figuratively. What's really hitting (landing) on the road is our feet or the tires of our car. The "hit" part is simply a way of saying that we are making a definite departure. It's a way to emphasize you're leaving a place or traveling somewhere. Again, because we say hit the "road" it's frequently used to describe travel by car (especially travel that takes several hours = a road trip). I'm sorry but I have to go home—we're hitting the road to Chicago early in the morning. Every time we hit the road my husband has to turn the car around and go back to get something he's forgotten. What time are we hitting the road tomorrow? Can you get off work by 5:00 PM? I'd like to hit the road before rush hour traffic and you know everyone will be headed towards the beach. John told me that I could either stay overnight with him or hit the road for good—so now he's my ex-boyfriend. Are you guys hitting the road already? It's not even midnight and people are just starting to arrive at the party. Fortunately we stayed behind and talked with friends so by the time we hit the road last night all of the traffic from the football game had cleared out. As soon as we hit the road, we got into an accident so we never went camping last week. I'm so tired I better hit the road now—it's a two hour drive back to the city. It was great to see you but I've really got to hit the road now. You're driving to Florida? What time are you hitting the road tomorrow? This is YOUR chance to practice by writing a sample sentence. Please don't be shy—I'll correct any mistakes you may make. When you last hit the road, where were you going? Do you typically hit the road early or late when you go to parties? When was the last time you hit the road?